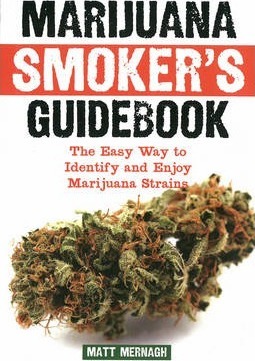 Matt Mernaghâ€™s Marijuana Smokerâ€™s Guidebook is the ultimate field guide for marijuana. Featuring 180 commercially-available cannabis strains from across the world, this book shows and tells you how to identify and enjoy the buds youâ€™ve got, the buds you want and the buds you might never even have heard of. Though there are a great many strain guides currently available, they all feature rare and difficult to find strains, and show how each different plant looks as it grows. This is great for cannabis connoisseurs and breeding professionals, but what about the everyday street smoker who just needs to identify and know about the buds heâ€™s buying? Written and photographed with this inquisitive everyday smoker in mind, Marijuana Smokerâ€™s Guidebook features 180 descriptions and smoke reports of North Americaâ€™s most popular marijuana strains as well as high resolution photos of each bud to show you exactly what your nugs should look like. Unlike some strain guides which use glorified catalog copy as strain descriptions, every single strain in this book has been smoked by Matt Mernagh himself, with an informative, original and entertaining write up and high resolution photo to bring you up to speed on your weed. Pocket-sized and featuring photos and descriptions of strains from Barneyâ€™s Farmâ€™s LSD to the elusive Jean Guy, and many more for all your favorite smokes, Marijuana Smokerâ€™s Guidebook is the indispensible resource for everyone who loves pot and wants to learn more about how to identify and enjoy good marijuana.